As the fifth episode begins, Littlefinger and Sansa arrive at the Bloody Gate, the only entrance to the Eyrie, and Littlefinger tells of how the Eyrie has never been sacked in its thousands of years of existence. Finally arriving at the Eyrie, Lysa Arryn is ecstatic to see Lord Baelish and Sansa meets her aunt and cousin, Robin, for the first time. After Sansa and Robin leave the High Hall, Lysa tells Petyr that she wishes to wed immediately and questions what other wife would do for him what she has done already. A major reveal, she goes on to mention that she executed Petyr’s plan to poison her husband, Jon Arryn, and then write a later to her sister, Catelyn, communicating that she suspected the Lannisters to be the culprits of this murder. There are major implications of this information as this takes us all the way back to the very beginning of the GoT series. 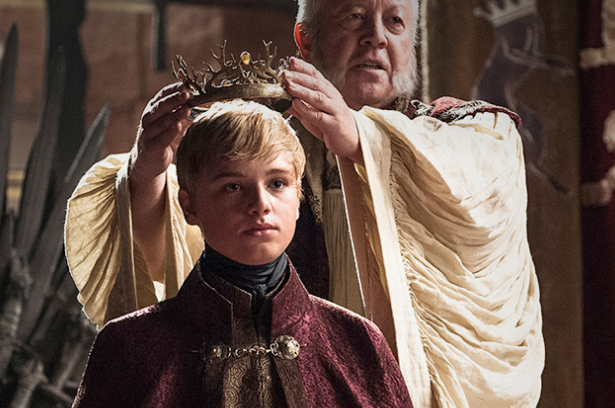 Up until now, we have believed that the Lannisters were indeed behind the murder of Jon Arryn, who had learned the truth of Joffrey’s illegitimate claim to the throne. However, we only believed this because of Petyr’s plot which was executed by Lysa Arryn. Littlefinger has been scheming from the onset, and taking advantage of her love for him, he has used Lysa Arryn as a pawn in his plan. Not only did she murder her own husband, but she lied to her sister about her suspecting that the Lannisters were behind the murder. In turn, Catelyn shared this information with Ned Stark, who further investigated the matter when he got to King’s Landing. His investigation, based on a false letter from Lysa, ultimately led to his death. We are once again reminded that there are many players in this “game,” each with agendas of their own, which may often be concealed and unknown. Later, Sansa speaks with her aunt, the first true family she has been with since leaving Winterfell. Most of us were probably hoping for a warm embrace; for Lysa to pull Sansa close, hug her as a mother and tell her everything will be okay. Instead, Lysa is jealous of Sansa, questioning why Lord Baelish cares so much for her and holding against Sansa the love Petyr had for her mother. Lysa tells Sansa how even though Petyr loved Catelyn his whole life, she rejected him for Brandon Stark, who almost killed Petyr in a duel for her love. On the other hand, Lysa has loved Petyr her whole life and she resents Sansa over the love Petyr had for Catelyn. And, as if things could not get worse, Lysa tells Sansa that she will marry her cousin, Robin, and become a lady of the Vale. Cercei turns to Margaery and asks whether she still intends to be queen, proposing her a new marriage to Tommen. Disingenuous, Margaery states that she is still grieving Joffrey and has not yet thought about this. The character evolution continues as we now see a Cercei who is willing to relinquish control of her son. After losing her first son to the Throne, she likely now realizes that it is important that Tommen has a wife who can help him; Cercei realizes that she alone cannot control the destiny of or protect her son. In Meereen, Khaleesi learns that Daario Naharis has captured the Meereenese navy, 93 ships to be exact, though he did this without order. With 10,000 troops and a naval fleet to cross the Narrow Sea, Khaleesi questions if it is now time to descend upon King’s Landing. Ser Barristan notes that there is a new king and King’s Landing is as vulnerable as ever. However, Ser Jorah notes that it is not just about capturing King’s Landing, but being able to rule over the entire continent, something she likely could not do with only 10,000 men. Ser Barristan reminds that there are many houses of Westeros that are still loyal to House Targaryen and would rally behind her cause should she return to Westeros to claim the Iron Throne. However, Ser Jorah tells Khaleesi that all is not well in Slaver’s Bay. The masters of Yunkai have reclaimed the city and enslaved those that she freed who did not leave with her. And in Astapor, a butcher called Cleon has defeated the council she put in place and now rules over the city. As she contemplates her options, Khaleesi asks how she could rule over Westeros if she cannot be trusted by her subjects. And again, we see the composition of Khaleesi’s attributes which make her one in a million. Any other ruler we have seen has implemented a philosophy of letting the ends justify the means. That is, they want to ascend the Iron Throne and all its power and glory, so much so that they will exercise most any means necessary to do so. Never have we heard somebody question whether they deserve to be king or if they’ve earned the trust of their followers. But for Khaleesi, it is the opposite — she will let her means justify the end and not the other way around. She believes she must earn the Iron Throne, by being a powerful yet compassionate ruler. And before considering King’s Landing, she makes it clear that she will fix what she started on Easteros and do what a queen must — rule. As they get ready for sleep, Arya reminds herself of the revenge she seeks and repeats the names of the men that she must kill. Before finishing, she rolls over and names the Hound as the final one. The Hound tells her, “Hate’s as good a thing as any to keep a man going.” It was a poignant message and speaks to the broader idea of the various things in this world that “keep a man going.” While each character has their own motives, it is important to consider the fire which drives these motives. 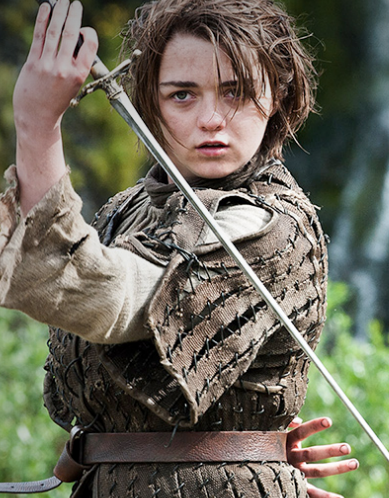 Sure, on the surface level, we know that Arya’s motives are to kill the men that have wronged her and those around her. But a bit deeper, we see that it is ultimately hate and the desire for vengeance that keeps her going. When we stop for a moment to look at each character and consider what exactly it is that keeps them going, we gain a bit more insight into the richness of each character and the way they fit into this world. The next morning, the Hound wakes up to find Arya doing a water-dance, something taught to her by Syrio Forel, a great Braavosi swordsman with whom she trained at King’s Landing. Again, the Hound mocks Arya’s impracticality and notes that this sort of thing will get her killed. Arya attempts to put her sword through the Hound, though she barely dents his armor before he smacks her to the ground. Cercei and Lord Tywin discuss the impending marriages which will strengthen ties with House Tyrell. Cercei says that she believes Tommen and Margaery can marry in two weeks, and two weeks after that, she will marry Ser Loras. As they discuss the importance of the Tyrell alliance, Lord Tywin admits to a very powerful secret that few are aware of: the gold mines of the Westernlands have not produced any gold in nearly three years. The Lannisters derive their power from their wealth and their wealth from their control of the gold mines that exist within the Westernlands. Without this wealth, their power diminishes and the alliance of House Tyrell, the next most wealthy house of Westeros, becomes all the more important. Making matters worse, Tywin reveals that the royal crown has a “tremendous” debt to the Iron Bank of Braavos — a debt that must be paid. Cercei engages Prince Oberyn and the two discuss the idea of power and love. More specfically, they explore the irony of possessing power but still being unable to protect those that you love. The powerful Prince of Dorne was unable to protect his sister Elia, much the same way Cercei was unable to protect her beloved Joffrey. Price Oberyn states that despite this, one can still avenge the murder of somebody you loved. Cercei tells Prince Oberyn that she is positive that Tyrion killed her son and implies her desire for Prince Oberyn to find Tyrion guilty. More explicitly, she asks for another favor, that Prince Oberyn deliver to her daughter, Princess Myrcella, the ship that Cercei had built for her. 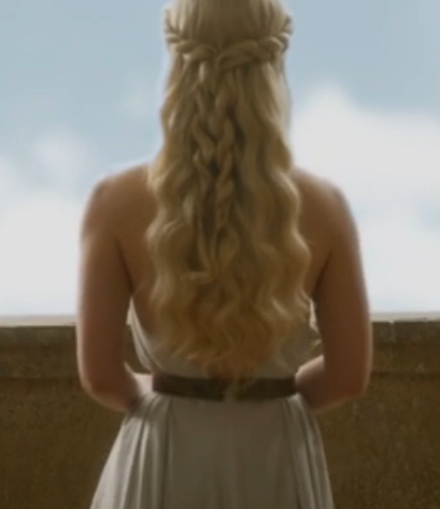 Princess Myrcella is still in Dorne, since Tyrion shipped her off and arranged her to be married to a Dornish prince. The Night’s Watch arrives at Craster’s Keep and Locke advances to scout the location. Returning to the others, Locke tells that they can easily overtake Craster’s Keep, and notes that they should keep clear of the hut where Bran and the others are being held, but lies about the the reason why and conceals the fact that he saw them there. 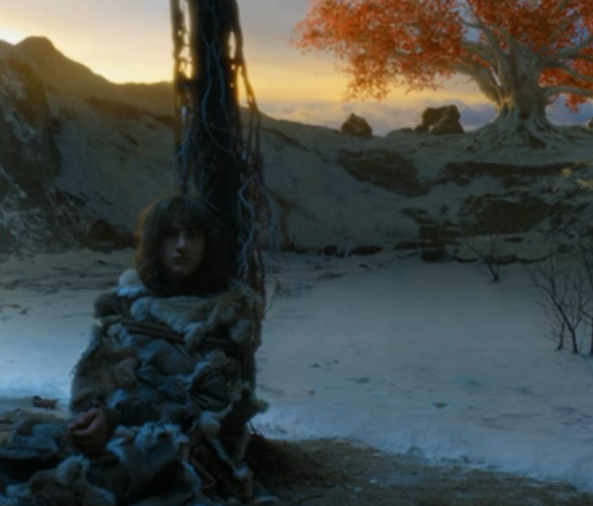 At the same time, we see Jojen’s vision of the great weirwood tree that Bran also saw in his vision. Jojen tells Bran, “He is waiting for you there,” and assures them that they will know once they’ve found the end. We also see Jojen’s hand engulfed in flame as part of his vision. Next, Karl chains up Meera and has plans to do terrible things to her. Trying to help his sister, Jojen tells Karl that he has greensight and offers to help him. When Karl tells Jojen about the terrible things he is about to do to Meera, Jojen reveals his vision and tells Karl, “I saw you die tonight. I saw the snow fall and bury your bones.” And at that moment, the Night’s Watch invade and begin the fight. Locke makes his way to the hut and captures Bran, the only reason he was there in the first place. Calm and collected, Bran skinchanges into Hodor and uses his immense strength to break the neck of Locke with his bare hands. After Bran regains consciousness, he tells Hodor to free the others. As close to Jon Snow as he’s ever been on his journey, Bran calls out to Jon, but Jojen reminds him of his greater calling — Bran must proceed north, something that Jon Snow would not let happen if they came together. Inside Craster’s Keep, Jon squares off against Karl and is losing the fight due to Karl’s dirty fighting tactics. However, one of Craster’s wives comes to Jon’s rescue and puts an axe into his back, before Jon ultimately kills him by putting his sword through the back of Karl’s head. As the Night’s Watch round up the dead bodies, it is realized that because Locke was killed and Bran did not get to tell his brother what happened, none of the brothers will realize what Locke was truly there for, or ultimately that Roose Bolton is on the hunt for Bran and Rickon. Jon is reunited with Ghost, and as Jon Snow invites Craster’s wives back to Castle Black, they communicate their distrust of the Night’s Watch and state that they do not wish to return with them. 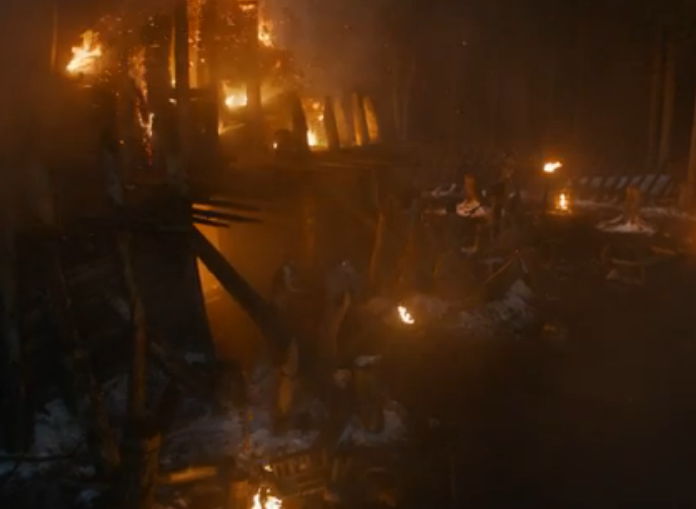 They spit on the ground and curse Craster’s Keep before burning it to the ground. This entry was posted in Episode Recaps and tagged arya, astapor, bloody gate, braavos, bran, cercei, craster's keep, daario naharis, daenrys, elia martell, ghost, gold, greensight, hodor, jojen reed, jon snow, karl, khaleesi, littlefinger, locke, lord baelish, lord tywin, lord tywinc, lysa arrynr, margaery, meera reed, meereena, night's watch, prince oberyn, rickon, robin arrynt, sandor clegane, sansa, second sons, ser barristan selmy, ser jorah mormont, skinchanger, syrio forel, the eyrie, the hound, the vale, tommen, tyrion, westernlands, yunkai. Bookmark the permalink.